By popular demand we are now giving you the full battery life breakdowns of the anticipated Microsoft flagship duo - the Lumia 950 and the Lumia 950 XL. We already published the Lumia 950 review and we found it to be a great way to restart the Windows mobile series. And while the Lumia 950 XL review is still in the pipeline you are getting a sneak peek of what’s coming next week. Both flagships utilize high-resolution Quad HD AMOLED panels - the Lumia 950 has it in 5.2" size, while its XL sibling stretches it to 5.7". The chipsets are quite different though - the regular 950 model has the Snapdragon 808 with a hexa-core processor, while the 950 XL runs on the Snapdragon 810 with an octa-core processor and liquid cooling. Windows 10 Mobile turned out a real surprise, offering great new features and long awaited optimizations, plus universal apps across other devices. The PureView camera turned out one of the best in business. But what about the battery? The Lumia 950 is powered by a 3,000 mAh unit, while the XL has 10% more power supply at 3,340 mAh. We expected the more powerful Snapdragon 810 chip married to a bigger screen to perform worse than the 808 platform but turns out we were quite wrong. The Lumia 950 XL posted great and very respectable 17 hours endurance on the 3G talk time test, doubling the Lumia 950 score. The web browsing on the Lumia 950 is just average at 7 and a half hours, but the Lumia 950 XL lasted some 3 hours more for a total runtime of 10 hours and 50 minutes. 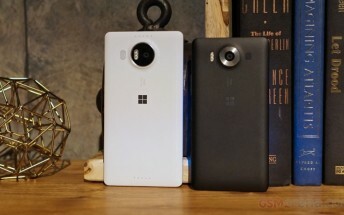 When it comes to video playback both phones outed decent ratings - the Lumia 950 played back our sample video clip for 9 hours and 40 minutes, while the Lumia 950 XL lasted for an extra hour. Unfortunately both phones are below average performers in their standby battery times and both can last only up to 7 days on a single charge when left idling. That's far from impressive, particularly when you consider the battery size. So, in our battery test the Lumia 950 scored an overall rating of 48h - the time it would last should you do an hour each of calling, browsing and video playback a day. The phone does average across all of the separate tests and in the standby endurance. The Lumia 950 XL scored a more respectable 62h rating. This type of score is above average overall, but when it comes to phablets, it's not particularly impressive. The mentioned usage pattern is of course entirely artificial, but we've established it so our battery results are comparable across devices. Our Lumia 950 XL review is almost ready now and you should expect it some time next week. There you'll also see how the 950XL performs in its DualSIM flavor. Stay tuned!